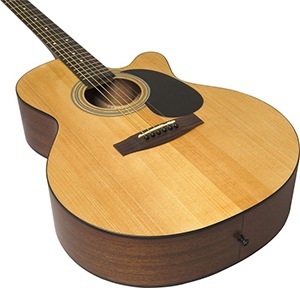 The Jasmine S34C NEX Acoustic Guitar is a grand orchestra-style guitar which features a Venetian-style cutaway for easier access to the higher frets.What sets the Jasmine S34C NEX from other models in the class is its innovative and advanced X-bracing that dramatically affects the way this puppy sounds. As far as the style goes, this is a grand orchestra guitar, meaning it’s a bit thinner in the waist than a dreadnought, and delivers a more crisp and bell-like tone. This makes it ideal for fingerpicking. Additionally, the S34C features a Venetian-style single cutaway, allowing better access to higher frets. The body is made of sapele, also known as “African mahogany” due to very similar qualities. It’s not as sturdy as maple, but it will withstand some punishment.For the top, the team over at Jasmine’s selected spruce for its powerful and direct tone, as well as incredible clarity even with aggressive playing. AS noted previously, the bracing is quarter-sawed scalloped X-bracing, with a twist. The guys at Jasmine’s decided to shift it slightly forward, so it would not only provide support to the top, but also allow for a more open and lively sound, with better definition and clarity.The mahogany neck is incredibly straight, although its slim profile might not suit everyone. On the other hand, the rosewood fretboard is perfectly comfortable. This puppy also features full body binding, making it an excellent travel or “crasher” axe, particularly given the more than approachable listed price. You could look at it as a stuntman, essentially. The Jasmine S34C features a glossy, natural satin finish which not only looks stylish, but also serves to maximize the resonance of the guitar to provide optimal sound quality.Action & FeelThe action is, in a word – perfect, with no dead frets or dings on the board. It’s close and easy on the fingers.The slim neck and 25.5-inch scale length give you a smooth feel and secure grip, which should add a degree or two of comfort when playing. The dimensions and 25.5-inch scale make the Jasmine guitar S34C model a scaled-down Jumbo, essentially, meaning it gives you the same power as a dreadnought, but with more openness and diffusion. Sapele makes the Jasmine S34C NEX Acoustic Guitar sound a bit more colorful than mahogany might, but there’s still the warmth and softness players have come to expect from mahogany. The back and sides do a great job fattening, so to speak, the clear sound of the spruce top. Expect to get good grind and bite out of this bad boy, with well-defined, crisp highs and somewhat muddy mids, but lots of thickness in the lows. The S34C comes with chrome tuners, which will come in handy once the strings lose the tune, which should take some time.